What is GEO-GUARD Vacuum Excavation? 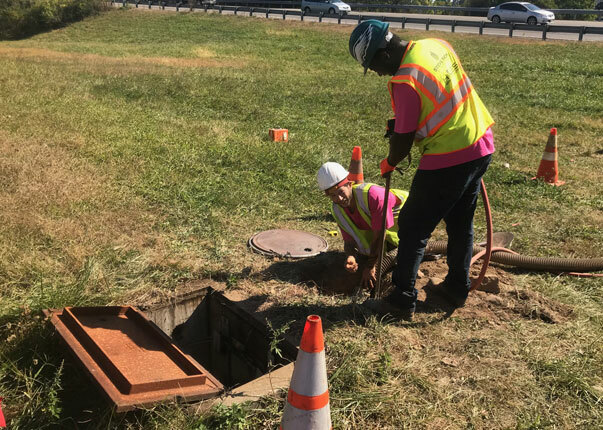 The precise location of underground utilities, underground storage tanks or other sensitive objects can be greatly enhanced by the visual inspection and verification. 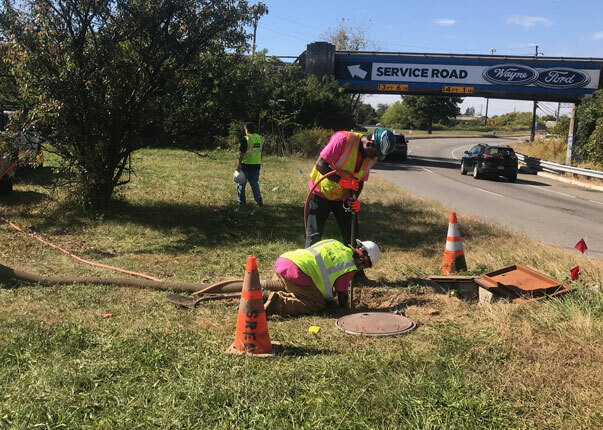 Some terminology refers to this practice as “Day Lighting”, “Soft Digging” and/or Subsurface Utility Engineering (S.U.E.). Most times these objects need to be verified or exposed by using shovels, picks or even backhoes. No matter how skilled the technician or operator, these devices can scar, puncture or even worse, rip up the objects that are meant to only be exposed for examination. The use of pre-excavation has been helpful to clear the path for drilling companies. In the past, areas have been soft dug and backfilled with sand to eliminate risk of unmarked utilities from being damaged. To avoid these mishaps, GEO-GUARD utilizes vacuum excavation in order to expose subsurface utilities and objects. Only a small surface opening is needed, typically from 5-12 inches in diameter and by the use of air jets and a powerful vacuum, a hole can be expanded to any depth. The jets penetrate, expand, and break up the soils in a precise, non-disruptive spatial location. All the spoils are put into holding tanks or containers for disposal or backfilling. The safe excavation of utility poles, signs, traffic signals, fencing, deck piers, etc. even around critical utilities or tight access locations. The cleanup and removal of soil, sand gravel or any other items in casings, manholes, rooftop stone and ballasts, cave-ins of soil around rebar and forms. The safe excavation including trenching and slot trenching. Horizontal excavation, underpinning or undermining of structures and foundations. Tank inspections and testing including soil sampling, corrosion testing and the installation of cathodic protection. Precise excavation around footings, foundations and piers for investigation and verification. The average excavation, 10” in diameter and 5’ in depth takes approximately 45 minutes, not including set up. Soil type, debris, cobbles, and other unknowns ultimately dictate exact time of excavation. All crews come equipped with a jackhammer to break and uncover asphalt and concrete (repairs quoted separately). Based on the verbal scope of work we estimate the following. We utilize a revolutionary technology called Air/Vacuum to locate and expose subsurface objects. Air and Vacuum technology is employed to quickly and efficiently move soil from test hole to holding tank or disposal vehicle (see below). Utilities and or tank ends are designated and marked using highly specialized electromagnetic and radio frequency instruments. Then, a 12” square opening is made just above the utility area. The buried utility is uncovered via air vacuum high pressure “Airlance” or “super sonic air shovel” which loosens the soil around the utility – without damaging buried facilities. A powerful air/vacuum pulls the soil out of the exposed area and deposits the material in a large mobile tank or temporary drum. 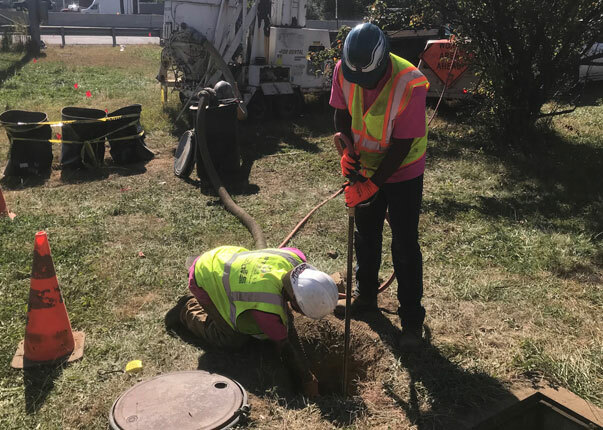 With the utilities exposed, depth can be verified, and mapping/surveying or adjacent excavation of drilling activities can be accurately performed. In cases of tanks, the tanks can be exposed for accurate tank testing. Utilizing Air/Vacuum technology, the entire process takes approximately 45 minutes per hole, is completely safe, and environmentally compliant. The only evidence of GEO-GUARD presence is a 144 square inch (or as in this case, round) patch.